Body comfort Ripstop Polyester upper fabric also found in the liners of our sleeping bags. Floor of PU coated tent floor fabric with 10000 mm water column. On very rough ground you can also slide in a layer of closed cell foam for added protection (e.g. 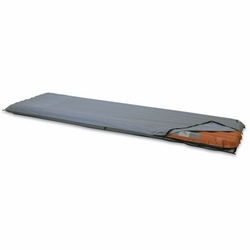 Exped Double Mat EVA - optional). To insert the mat: fold the inflated mat between your legs, slide the cover over the mat beginning at the foot end. Distribute the zipper gliders so you can access the mat valves when needed.